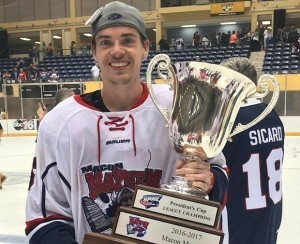 Former West Genesee High School ice hockey captain Ryan Michel helped the Macon Mayhem win the Southern Professional Hockey League playoff championship and the President’s Cup on Sunday night with a 2-1 home victory over the Peoria Rivermen. Michel, who graduated in 2010 after leading the Wildcats to an undefeated season and the Division I state championship, is a defenseman for the Mayhem. He had one goal and five assists during the playoffs. Michel played four seasons at Hobart College after graduating from West Genesee.